....when the skies of November turn gloomy. 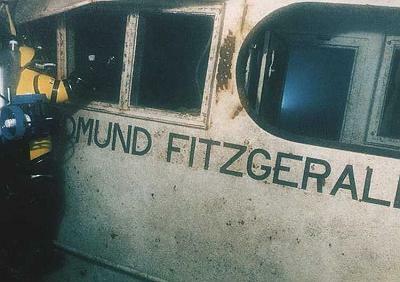 ...Gordon Lightfoot, "Wreck of the Edmund Fitzgerald"
Among the photos of the Edmund Fitzgerald that Great Lakes explorer Frederick Shannon shared was an image with two unexplained orbs or burning objects about the size of golf balls. 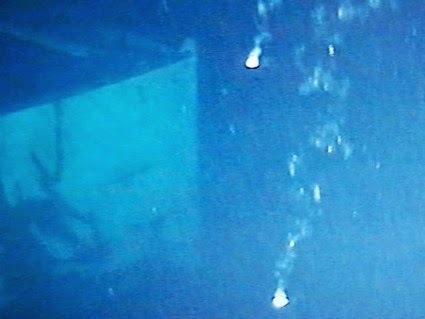 Known as Image 2028, the photo was among more than a thousand taken by Shannon from inside a two-person Delta submarine while hovering 530 feet below the surface of Lake Superior off the starboard (right) side of the Fitzgerald's bow in July 1994. "No debris was in the water, and nothing was dropped from the surface," Shannon said. "There is no logical explanation for their sudden appearance." The objects, which left a trail of bubbles in the murky photo, floated toward and disappeared into the hull of the ship, he said. The mystery. The history. That song. Whatever the reasons, the wreck of the Edmund Fitzgerald endures as a subject of endless fascination. "That doesn't surprise me," Tom Farnquist, executive director of the Great Lakes Shipwreck Historical Society, said Monday, as he fielded an annual round of calls about the Nov. 10 anniversary of the disaster and the ceremony that will mark it Wednesday at Whitefish Point. "There are schoolkids who do a report on it, and they just get obsessed into adulthood with it," he said. "It happened recently enough (1975) that a lot of people are still around who remember it. "And there are still probably more questions and theories than answers. ... There's a full explanation for all the other shipwrecks, but nothing was ever conclusive about the Fitzgerald. There were no survivors. 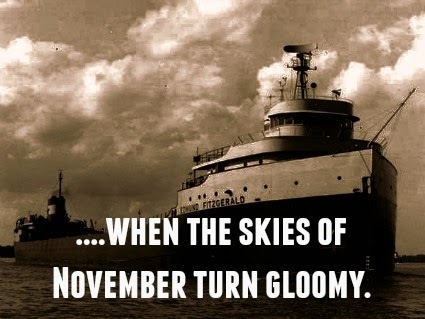 And that song ..."
"That song" is "The Wreck of the Edmund Fitzgerald," by Canadian troubadour Gordon Lightfoot, which, despite its grim subject, climbed to No.2 on the Billboard pop charts within a year of the disaster and is replayed on radio stations around the country every November. Lightfoot was initially subjected to some criticism for making a commercial success out of the tragedy, but insisted that the song was a tribute to the crew and today enjoys a good relationship with the families of the men who were lost. "He came here in '95 for the ceremony, and the families asked him to never stop singing it because it is keeping those men alive," Farnquist said. He said about a dozen relatives of the 29-man crew lost on the Fitzgerald are expected at Whitefish Point for this year's observance. The society's museum at the Point -- the nearest land to the wreck site -- houses the 200-pound bell from the Fitzgerald, which was recovered in 1995. The Shipwreck Museum, at the end of a road leading to Lake Superior, is only open May 1-Oct. 31. "Up where we are, you have to want to drive here, you're not going to happen upon us," Farnquist said. "They want to know about the Fitzgerald. Some people just want to stand on the shore and look out at the lake, as if they want to feel it." At 729 feet long, the Fitz was a giant among lakes freighters. It lies in only about 550 feet of water, a testament to the forces of nature on the Great Lakes. That may be some of the allure of the Fitzgerald story here in the Great Lakes State, where you grow up being warned "don't argue with the lakes" and get quickly to shore when skies darken. People from elsewhere who have no concept of the scope of the lakes -- or the fury they can unleash -- may wonder how such a mighty vessel could be destroyed in waters not nearly as deep as the boat was long. But those who have seen the lakes angry, those who know that the loss of the Fitz was, in fact, far from the worst of many such Great Lakes tragedies, understand the power that comes with the beauty around us. I have a white Bible that was all we salvaged from our house after Katrina. EVERYTHING else was buried under black mud. leaving the only polished place in the house on the countertop it was left on. The tragedy was that she was a disaster looking for a place to happen. no depth sounder but a rope-type "lead-line"
tried to blame the Captain&Crew. "economic hardships for the owners". Northwestern Mutual Life Insurance Company. and she ran too deep after that. head sea uncontrollably and she had no choice but to come all the way about. she was,again,a disaster looking for a place to happen. At least the Titanic resulted in improved safety. don't think that everyone up there on the Lakes was taken totally by surprise. Three Sisters that took her there. indicate their arrival coinciding with the foundering of the Fitz. the first unmanned sub was there. They speculated that she broke up on the surface. Any honest man will just admit when they don't know. That Bible was completely underwater for over a week. and then came the Mud&the Mold. including the walls&floors which were stripped and scrapped. Orleans and Jefferson Parish in Metairie.